Created by VERSATEX, the patent-pending Stealth Trim System is designed with the builder in mind. 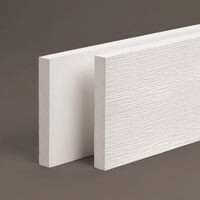 Our system, which features cornerboards, skirtboard, fascia, frieze and window surrounds, will allow for faster and more aesthetically pleasing installations time after time. The ¾” pockets and now 1” pockets on our 5/4" boards, will accommodate any siding product including fiber cement, cedar, and vinyl.